"Zobrist created a plague." Sony has debuted the first official teaser + a better international trailer for Ron Howard's adaptation of Dan Brown's Inferno, once again starring Tom Hanks as Robert Langdon. This is the next film in the trilogy also featuring The Da Vinci Code and Angels & Demons, which were directed by Ron Howard starring Tom Hanks. This time he wakes up in Italy and ends up on another crazy adventure involving history. The cast also includes Felicity Jones as Dr. Sienna Brooks, his sidekick this time, plus Ben Foster, Irrfan Khan, Omar Sy, Sidse Babett Knudsen, Ana Ularu and Ida Darvish. This looks pretty much exactly as you would expect it to, with tons of weird action and lots of history flying at you, and exploding. The teaser is okay, but the international trailer (also below) is much better - watch both. Enjoy. 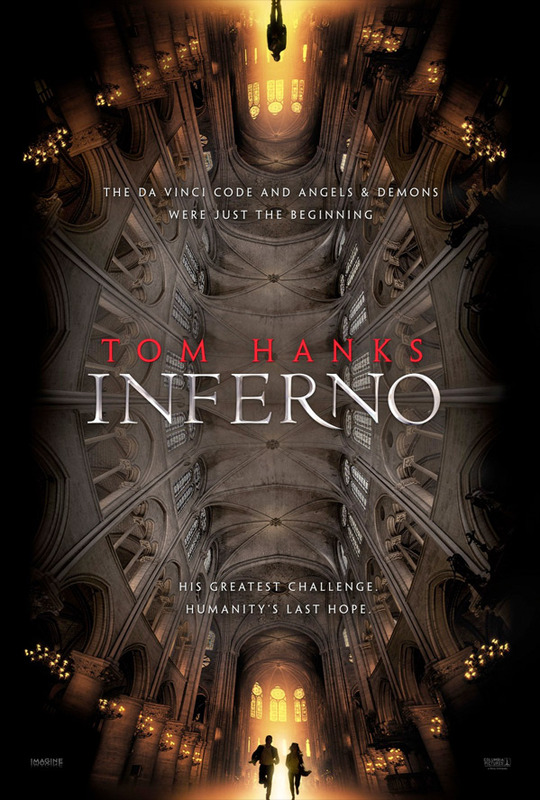 Academy Award-winner Ron Howard returns to direct the latest bestseller in Dan Brown's (Da Vinci Code) billion-dollar Robert Langdon series, Inferno, which finds the famous symbologist (again played by Tom Hanks) on a trail of clues tied to the great Dante himself. When Langdon wakes up in an Italian hospital with amnesia, he teams up with Sienna Brooks (Felicity Jones), a doctor he hopes will help him recover his memories. Together, they race across Europe and against the clock to foil a deadly global plot. Inferno is once again directed by actor-turned-filmmaker Ron Howard, of the two previous Dan Brown adaptations (The Da Vinci Code and Angels & Demons) plus In the Heart of the Sea, Apollo 13, Willow, Cinderella Man, Frost/Nixon and many other films. The screenplay is written by David Koepp, adapting from Dan Brown's novel. Sony will release Inferno in theaters everywhere starting October 28th this fall. I really enjoy reading Dan Brown's books, and so far I've enjoyed the films. I'm expecting I'll enjoy this one as well. So much antique furniture getting destroyed. The previews two were absolute garbage. The only good thing was Zimmers score. The plot, casting and revelations were laughable. I thought the last two were a lot of fun, well worth it. Apparently people love mediocre filmmaking. But you know, One man's trash is another man's treasure. So knock yourself the *** out. For me are these kind of movies fun to watch at home, on a Sunday. I still think the casting of Tom hanks is a big mistake, he just isn't Robert Langdon. Having read all the books I could not agree more.. as much as I like Tom Hanks, he was not a good choice to play Langdon. yes i thought Pierce Brosnan would be a great Robert Langdon. I always imagined him when reading the books. Yeah not a bad casting call. MOSDEF a money grab. But Ronny and Tommy make for a pretty decent watch.